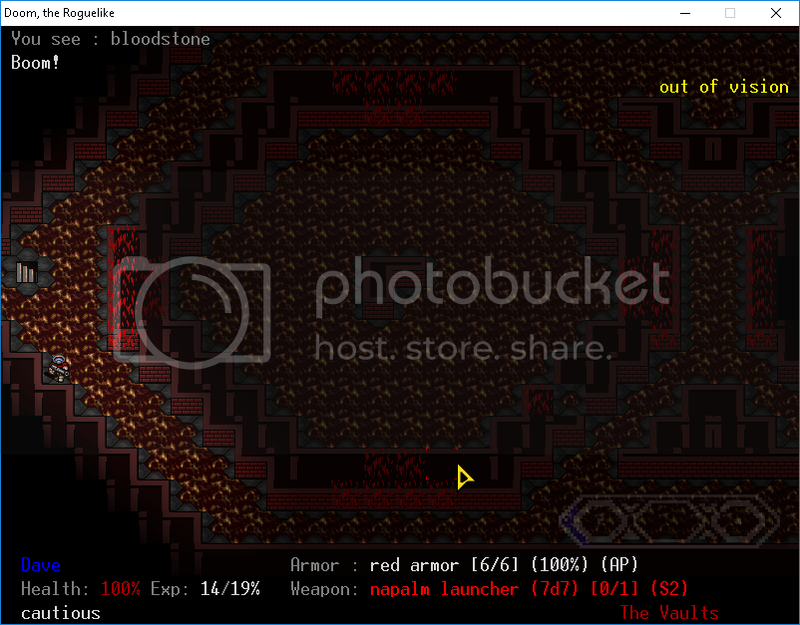 Strategy was simple: I stocked up on rockets and painted every single tile of the Vaults with lava. Now that is some impressive and creative thinking. Well, it still counts as clearing the Vaults "by luck" - the napalm launcher is quite a rare find. Congratulations! I covered every tile outside the center vault with lava, then used a phase device. This forced the phase device to put me in the center vault (the only other valid tile was the exit stairs). Cerebus boots definitely help with this strategy but I guess they're not strictly necessary. Funny story: The acid spitter, aka the other gun which could have been useful for this strategy, was sitting pretty inside the center vault. It disassembled into a nano mod so I'm not complaining. Huh. That's quite clever. My answer to this challenge was the standard spam AoOC runs for Azrael's Scythe, then hope for enough health kits to restore energy enough times to reap everything with the secondary fire - but you've innovated a technique which, as far as I can tell, has never been used or even described before. On top of that, you've managed a YAAM YAFW that's for all intents and purposes a complete conqueror win on Ultraviolence, other than the miscalculation with the Cathedral, which is a pretty high difficulty achievement - I have two Angelics, and have only completed Conqueror once(I find it so challenging that I almost never even attempt it), so I'd say you're definitely capable of going for the easier ones with a reasonable possibility of success, and you're probably better qualified to consider the more difficult ones than I was even at my peak. And yeah, if you want to get Conqueror, you need to invest a few levels in getting Berserker, (Or hope for a Hatred skull from City of Skulls/Abyssal Plains) and/or play some kind of melee or melee hybrid build. I'm amused that I'm really the first person to think of this strategy. Because the second I saw a challenge that said "by luck", my first two thoughts were "What are the odds of success?" (quite poor) and "Are there any items that could raise the odds of success?" (yes, two such weapons). I just assumed people were going to say this was the standard way of getting it. Similarly, I already did Conqueror on HMP a few months ago, using Malicious Blades because it seemed like the "obvious" choice (most of the advantages of a melee build, but you still get a boost when shooting things in the Mortuary, and a hatred skull can take care of the Angel of Death). You can expect a post incoming within the next couple days when I redo that on UV. edit: Also, it just occurred to me that my solution gets all the loot while the "standard" solution does not. Which I find quite amusing. Well, as ZicherCZ said, the Napalm Launcher is quite rare (and the Acid Spitter is even rarer, not to mention much less functional for this purpose) and besides, it takes *a lot* of rockets (or a Nano mod) to make this work, so this strategy is incredibly luck-dependent. You would be far more likely to get a handful of phase devices, which I would consider the more "standard" way of getting in there if there is one. Maybe, but you can control how many rockets you're carrying a lot easier than you can control the game spawning a stack of phase devices. And a sufficient number of rockets takes up less inventory with the backpack (more than half the rockets I used spawn for free on that level, 2 full stacks plus a rocket box is enough). You can't expect a napalm launcher on any given run, but you can expect to get one eventually and modify the plan for that run accordingly. edit: Aaaaand I just completed an actual Conqueror run on UV for the platinum badge. It doesn't even feel like enough of an accomplishment to make a thread, I just did the same thing again except with Malicious Blades, Lava Boots and Antigrav Boots. It just takes a long time. Yes. I think that it has been quite quiet of late. Maybe when JH is released, it will be as lively as before. That said, there has been a dilution of communications platforms, what with the extensive use of Discord and/or streaming outside of the forums. We'll see how it all ends up.